narrative filled with stories from the cast. To a degree that's what your getting with Caseen Gaines' latest book. 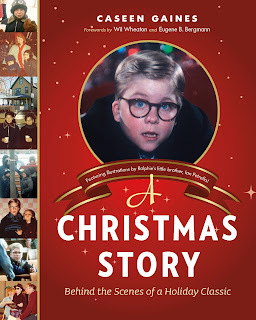 There are stories about the history of the film and personal tales from varying cast members, but in large the book isn't so much about the making of A Christmas Story, as it is a book about the making of an obsession. It opens with a pair of forewords by Wil Wheaton and Eugene B. Bergmann. With Wil Wheaton we are welcomed to a bit of nostalgia regarding a youthful Christmas, and his own experience trying out for the film. With Bergmann we get somewhat the opposite. An introduction to Jean Shepherd, the man behind the material, as well as the voice narrating the beloved film. It is here that Bergmann is quick to inform us all about Shepherd's lack of enthusiasm for nostalgia. A sort of paradox that fills his work. It is in many ways setting the tone for the rest of the book. The first few chapters tell of the creation of the film. How director Bob Clark fell in love with Jean Shepherd's stories on his radio show. What it took to get the film made when no studio wanted it. It features stories from cast members recalling moments from production. It's a fascinating look at what it took to make the film we've come to know so well. Shortly though Caseen switches gears on us. The rest of the book relates stories post-film. 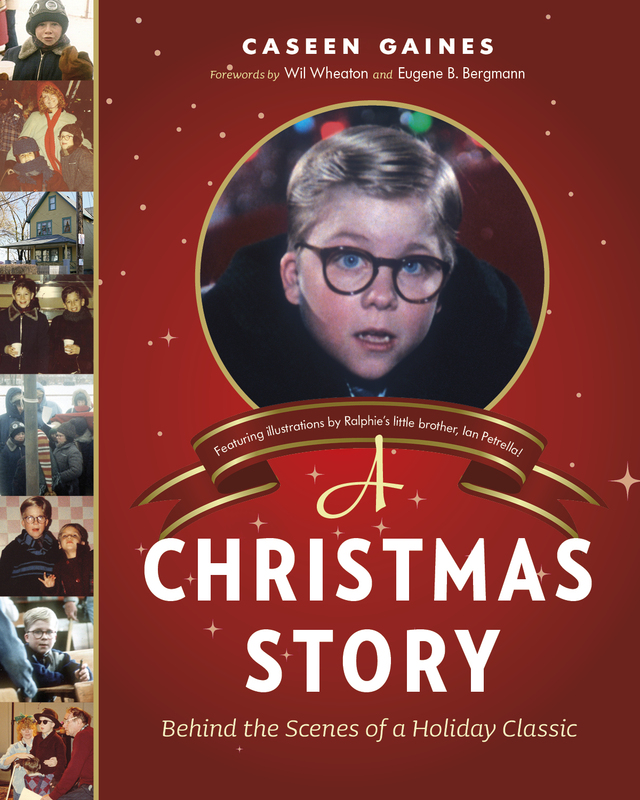 We catch up with Ian Petrella who played Ralphie's little brother Randy in the film (and who provided the illustrations throughout the book including the cover design). There are bits here and there from Tedde Moore who played the teacher in the film, and Zack Ward who played the bully Scott Farkus. Caseen Gaines' book spends a lot of time on the restoration of the house the movie was shot at in Cleveland, which has become a sort of Graceland for A Christmas Story. Here there be guided tours, merchandise, and props used in the film. There's also time spent on the Canadian side of the border where most of the film was shot. We learn of the fate of the only known copy of a director's cut of the film, featuring many scenes removed from the final movie. Finally we move on to the creation of the Broadway musical, and what it took to bring A Christmas Story to a new medium. The transition of focusing on the film to the fandom is a bit jarring initially, but the stories are so entertaining that you quickly find yourself drawn into people you've never heard of. While I found myself wishing for more of the backstage stories from the cast, I can understand the change up. Here is, after all, the real heart of the film; the people who've taken a mediocre box office performer and elevated it to one of the most loved holiday films. If I have one real issue with the book it's Bergmann's foreword which sounds like a speech he's rehashed a dozen times. Not that what he's written is bad. There's no denying the knowledge he brings, but with much of the same information being related throughout the book, it tends to feel redundant rather quickly. His foreword could easily have been excluded, with him just being listed as a source. Caseen's narrative for the most part is comfortable, bringing the reader in and making them feel at home. Though unlike his last book where his love for PeeWee Herman remained clear cut, there are moments when reading between the lines feels like there's a slightly ironic tone. The movie may conjure memories of childhood viewings, but it's still a piece of the commercialization we face every Christmas. Caseen illustrates this without ever making it a point of focus, removing some of the nostalgia without destroying the heart, or humor, behind it. A feature Jean Shepherd himself would have appreciated. I thought you made this book up until I saw the Amazon link. For some reason this movie stayed off my radar until my 20s, when TBS started airing all day marathons of it. I only wish I had the youthful nostalgia for this movie that pretty much every other person in the world has. It's more common for younger generations. It started picking up steam mid 90's. The book sort of covers that too. Love your honest review. Funny story, I was friends with Ian on My Space - true story. No idea how I convinced him to add me either. Do you think it's odd that they had Will Wheaton write something? I mean, he's cool and all, but what's the connection there? That's pretty cool. Ian has a facebook page you can interact with him too. Wil Wheaton auditioned to play Ralphie in the film. He includes a little anecdote about the experience. Too bad about the book, but man do I love that movie. I don't watch it every year, but when I do, I still love it. Good post Tim. Think I'll just stick with enjoying the movie. Sometimes things can be over-analyzed.